The main Watford news on Saturday morning was the signing of Colombian international, Zuniga. While I don’t tend to get too excited about new signings until I see them play, the signing of an experienced wing back could only be a good thing. But, with the first team flying out to their pre-season training camp in Austria, Saturday’s focus was on the U21s first game at St Albans. I met Toddy in our usual pre-match pub for a lovely lunch in the beer garden before heading for the ground. On arrival at Clarence Park, we bumped into Jon Marks and had a good catch up. With many of last year’s U21s having been released, I wondered what the team would look like and was not surprised to see two trialists and a number who were in the U18s last season. The starting line-up was Trialist GK, Eleftheriou, Stevens, Belkalem, Trialist, Murray, Ovenden, Stewart, Pereira, Jakubiak and Adeyemo. The U21s had a very disappointing season last year and there was an impression that there was quite a distance between them and the first team. Given that Mazzarri is a proponent of 3-5-2 and the U21s were lined up in a 4-4-2 formation, the first indications were not positive that there will be more of a collaboration between the development squad and the first team this season. The young Hornets started brightly with Jakubiak setting up his strike partner, Adeyemo, who shot over the bar. But, on a very warm afternoon in Hertfordshire, chances were at a premium. The best came when Murray unleashed a volley that tested the City keeper, Russell. Towards the end of the half, Jakubiak broke into the box and forced another save from Russell, but the first-half ended goalless. The home side had had chances of their own, but none that tested the unknown goalkeeper. 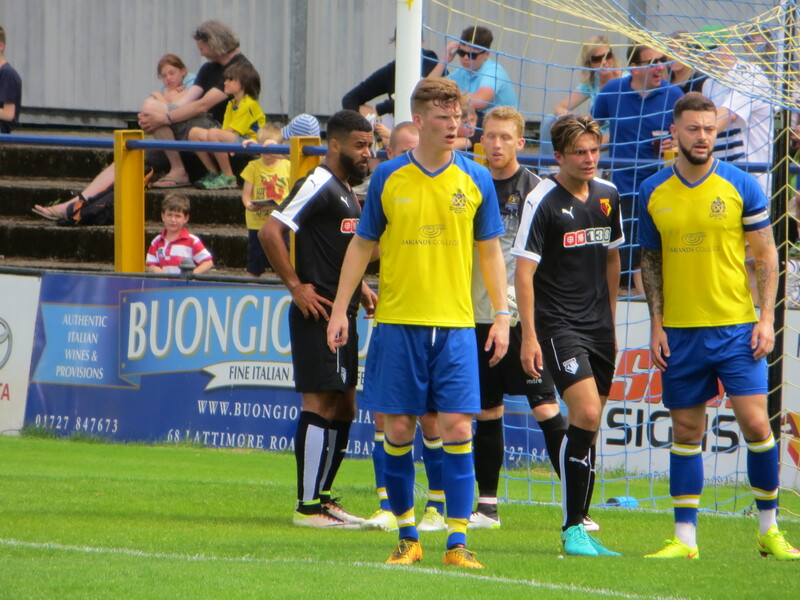 There were a number of substitutions at the start of the second half with Watford bringing on two more trialists and replacing Jakubiak and Adeyemo with Folivi and Obi. The substitutions for St Albans were a bit of a blast from the past as they introduced former Watford youngsters Matty Whichelow and Billy Gibson. Whichelow, who was a player that I had a soft spot for, had the best chance of the game with a cracking shot that the Watford goalkeeper had to tip over the bar. St Albans dominated the first period of the second half as captain, Theophanous, hit a shot wide and Whichelow again drew a save from the keeper. The most notable event of the half for the Hornets was a clash of heads between Belkalem and his team mate Ryan. The youngster had jumped late for the ball, causing the clash but, as he fell to the ground with blood pouring down his face, I thought Belkalem should have made sure he was all right. It was then that I noticed that the Algerian, who had shrugged off the challenge, was also bleeding. The St Albans physio saw to his injury and, being made of stern stuff, he was soon bandaged up and returned to the field. Ryan, sadly, was unable to continue and, because Watford could not make any more substitutions, they were down to 10 men. But the Saints’ manager, Ian Allinson, made the very sporting decision to withdraw one of his players (his captain) to even things up. In the last minutes of the game, both of the Watford strikers had chances to win the game as, first, Folivi broke through and hit a shot that was blocked by the keeper. Then Obi received a lovely pass from Stewart before shooting straight at the keeper’s legs. 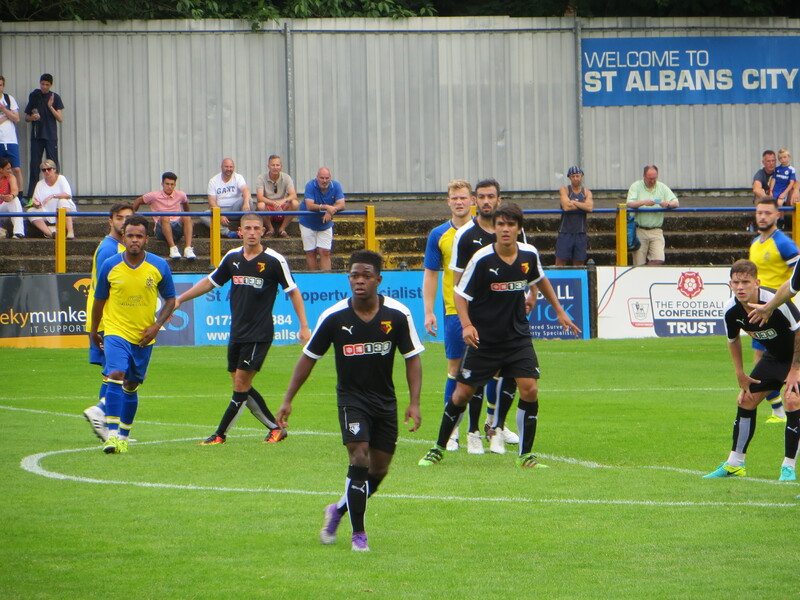 So the game finished goalless on a very hot afternoon in St Albans. It was not a happy start to the U21 season and I was disappointed to hear that their next game would be held at the training ground and so would not be open to fans. I really hope that the U21s are given more opportunities to play in front of supporters next season and that they are integrated further with the first team as there are some great youngsters there that deserve that opportunity. This entry was posted in Watford FC and tagged Alex Jakubiak, Andrew Eleftheriou, Billy Gibson, Carl Stewart, Connor Stevens, Dion Pereira, Essaid Belkalem, Ian Allinson, James Russell, Matty Whichelow, Michael Folivi, Ogo Obi, Ola Adeyemo, Rhyle Ovenden, Sean Murray, St Albans City FC, Watford FC on July 17, 2016 by franelynn.